It was a holy structure - assembled by what some might consider an ensemble of 'unholy' craftsmen -erected within the unwelcoming walls of upstate New York's Clinton Correctional Facility, aka Dannemora Prison, aka 'Little Siberia.' An ambitious project set into motion by a compassionate priest, this Catholic house of worship would enter history as the first of its kind; underscored by a series of events that encompassed everything from comedy to empathy to unfortunate tragedy. 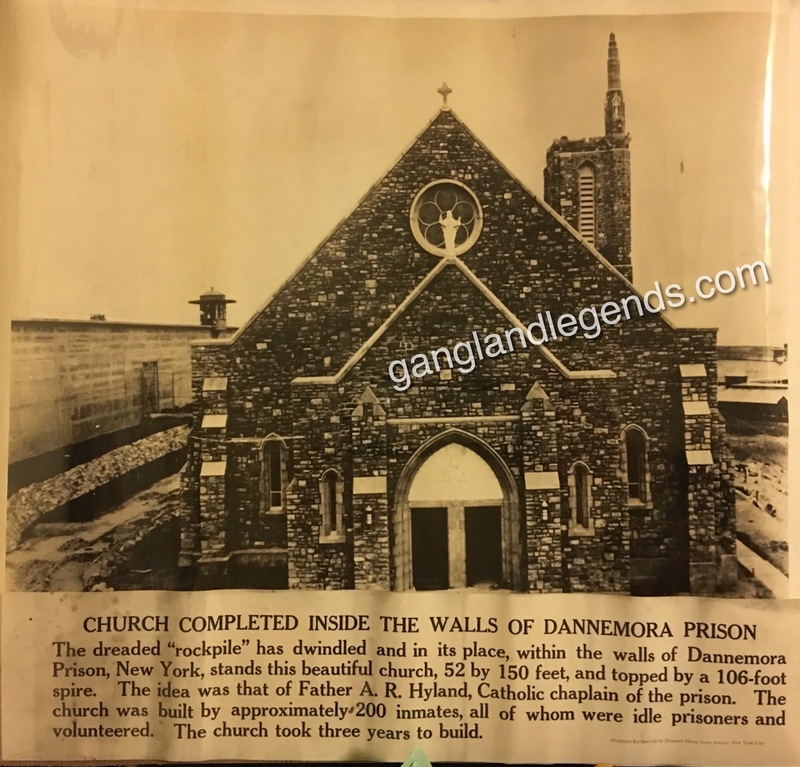 Here is a tale of a 'Prison Padre,' his grand idea of building a chapel within a place of despair, the all-volunteer workforce whose labor brought the vision to life, the 'Saint' who inspired it, and even an anectdote involving America's most notorious gangster of the time. When Father Ambrose. R. Hyland arrived to the gates of his new parish in the fall of 1937 he observed a scene of general melancholy; Dannemora's prison had a bad reputation and the faces of inmates certainly conveyed as much. There were a few positive elements - a good library and fine kitchen facility - but the landscape was missing something. "Where's the Church?" the Chaplain asked his tour guide. The query fell on somewhat dumbfounded ears. No prison had a literal free standing house of worship on its grounds. For the first few months, Father Hyland and his colleagues made do with makeshift services above the assembly hall. Hyland dismissed the odds and allowed very little to deter his passion - to bring some peace and hope to the otherwise hopeless place. The new clergyman wasted no time in developing a plan to put a real chapel on the grounds. 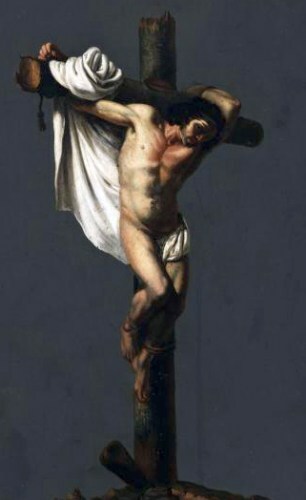 Notwithstanding the unusual and undeniably daunting precedent he intended to set, Ambrose was a determined. It took a couple years, but he eventually won over the necessary factions (the Governor, the Cardinal, and both his clergy counterparts - a Protestant minister and a Jewish Rabbi), and inspired two-hundred convicts to volunteer their blood, sweat and tears in constructing the building (the workforce was comprised of various ethnicity and religious denominations, even atheists). Hyland received $5000 dollars from the Catholic Church, but the rest of the funding had to come from other sources. The project, which was inspired by and named after The Good Thief - Saint Dismas - officially broke ground in 1939; the remnants of a demolished cell block served as the initial building material, donors (also from various denominations) would later supply other materials, decor and funding. Who is this Dismas fellow anyway? The 'good thief' is commonly recognized as a Saint of the condemned, and celebrated March 25 - Feast Day. As the story goes... of the two theives cruxified with Christ, one was peninent, one was not. The former, who was not identified by name in the Bible, admitted his guilt and earned immediate salvation from Christ himself - "This day thou shalt be with me in paradise." Interestingly, although Dismas is a venerated figure within Catholicism - he is not officially recognized as a Saint in Catholic canon. Dannemora's infamous dungeon held more than a few equally infamous criminal figures over the years. Of the convicts who volunteered their time and talents, there was a safe-cracking nitroglycerin expert, a forger, and a stick up man who made an offer the good Chaplain definitely had to refuse! "Father, I'll get it all for you. Just give me two nights and two guns." And then there was Charlie. One of the most notable standouts of the entire inmate lot had been placed there just a year prior to Father Hyland's arrival. 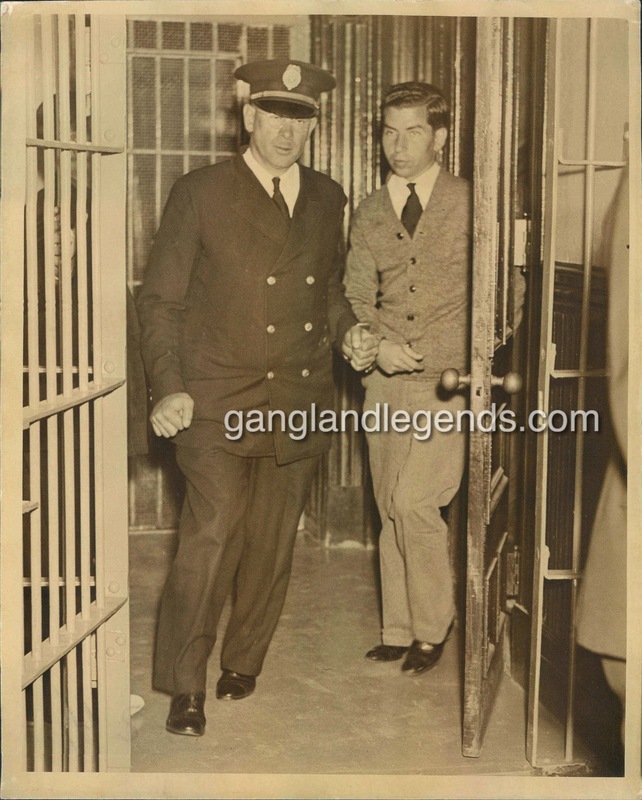 Convicted of being a pimp overlord, Salvatore Lucania, aka Charles 'Lucky' Luciano , once dubbed "the most dangerous gangster" by the zealous prosecutor who rallied to have him put away for 30 to 60 years, came to Dannemora after a very short stint in Sing Sing. Despite not being a particularly religious guy himself, the incarcerated crime lord offered the kind priest some assistance... in trademark Lucky style of course. Father Hyland told Luciano about the initial donation the Cardinal had given, but the cost of construction would ultimately far exceed the appreciated and generous (yet considerably small) sum. "You now have $5000?" the gangster asked rhetorically. "I read the New York papers every day, and I know how to pick horses." Father Hyland listened as Luciano continued his proposal, pointing to the paper, "Bet it on these three horses tommorow." The priest gracefully declined the offer, adding - "The Cardinal wouldn't like it, even if they all won." Curiosity however got the best of Father Hyland. He looked into the results of the longshots Lucky insisted were sure bets. Indeed, Charlie Lucky's tips, had Father Hyland acted on them, would have netted the payout as promised. 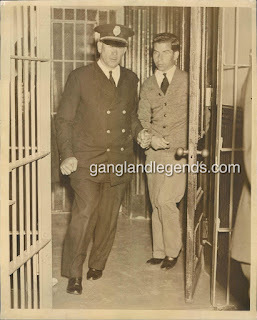 "Follow my advice and your five (thousand) will become fifty (thousand)" - Charles 'Lucky' Luciano to Father Ambrose Hyland. Not long after the incident, the young chaplain was summoned to the Warden's office. Naturally, Hyland felt confident the 'Luciano' issue probably had something to do with it. To his surprise, the Warden hadn't mentioned Lucky at all, but rather an entirely different kind of controversy brewing. "It seems a committee has been formed," Warden Snyder began. "Calls itself the New York League for Separation of Church and State." Snyder went on to explain how the group filed an injunction to stop the construction of the church. Father Hyland and his attorney went on to win the case and on April 6, 1941 the 156' by 50' structure (topped with a 106' spire pointing to the heavens) named St Dismas Church of the Good Thief was inaguarated. Father Ambrose Hyland's dream came true and it garnered national attention. The media clammored to tell the story, even Hollywood came calling. On a deeper level, inmates would go on to speak of how the project and the good priest quite literally changed their lives for the better, which was truly all that Hyland hoped for all along. Father Hyland had been dealing with some health problems - blood clots in particular - and left the prison in 1953. He returned to his hometown of Chateaugay, New York, but continued to visit churches and do speaking engagements. He was on his way to one such engagement on October 2, 1954 when tragedy struck. It was just about midnight when motorist John Slatcher noticed a burning vehicle on the side of the Route 9, near Schroon Lake. He quickly called for neighbors and the fire department, but it took several more hours for positive identification of the lone male victim inside the burned out car. The dead man was indeed Ambrose Hyland. The 54 year old priest was found on the passenger side of the sedan, which was parked well off the road, with the ignition off. The clues caused suspicious concern, and authorities considered an inquest. Investigators ruled out 'foul play' though, as the coroner's findings stated a "heart attack" as the cause of death. Additional factors, which included Father Hyland' fondness for cigars (a 'heavy smoker' of the product, it was reported) and of course the blood clots that plagued him for the last couple years, led to the media reporting a theory that investigators had apparently been leaning heavily toward - Father Hyland died of a heart attack and dropped a lit cigar which ignited the vehicle's interior. 1. Journalist Robert 'Bob' Considine wrote the screenplay for the purposed movie version of Father Hyland's story. 2. MGM offered Father Ambrose Hyland a handsome fee to option the movie rights, but the project was scrapped 1945. 3. The story did however get a well-received book version released - 'Gates of Dannemora' written by another priest, Jon Louis Bonn, Doubleday, 1951. 4. Father A.R. 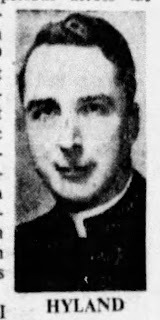 Hyland was the first 'paid' New York State chaplain. 5. The church's first organ, a $25,000 theatrical model donated by two Jewish brothers, was later replaced by a then-modern electronic model. The original organ had to be relocated to a state museum in order to save it from further damage (the extreme temperature fluctuations in the prison were to blame). 6. Sources often state Lucky Luciano donated red oak for the church pews (seating capacity = 1200). According to a 1989 interview with Father Hyland's niece - Luciano donated some special oak which was used in the church doors. 7. The church alter was made of wood from one of Ferdinand Magellen's ships, donated by a distant relative of the explorer. 8. Carmelo Soraci, convicted of forgery, hand painted all the stained glass windows and the Dismas mural behind the altar. Twenty years later his artwork (Dannemora and Sing Sing) was valued at $100,000. Soraci left the prison system for good in 1960 and went on to write an autobiography "The Convict and the Stained Glass Windows." AP. "Prison Walls Converted to Churchly Use." Rochester Democrat and Chronicle. July 23, 1939. P. 11. Brandeis, Eric. "Looking at Life." Montana Standard. October 31, 1954. Page 4. Considine, Bob. "Prison Life." The Cincinatti Enquirer. January 10, 1944. P. 14. Lyons, Leonard. "The Lyons Den." Pittsburgh Post-Gazette. March 10, 1943. Page 25. Lyons, Leonard. "The Builder." San Mateo Times, October 12, 1954, P. 14. Lyons, Leonard. "The Lyons Den." New York Post. January 29, 1962. P. 3. Mooring, William H. "Hollywood Veers Away From Religious Pictures." August 31, 1945. Section 2. Page 1.